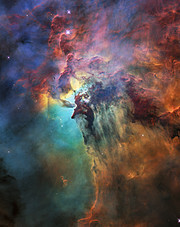 To celebrate its 28th anniversary, Hubble took an image of the central regions of the Lagoon Nebula, a star-formation region only about 4000 light-years from Earth. It observed the nebula in both optical and infrared light. The image displaying visible wavelengths reveals a fantastic landscape of ridges, cavities, and mountains of gas and dust. This dust-and-gas landscape is being sculpted by powerful ultraviolet radiation and hurricane-like stellar winds unleashed by a young star. Located at the centre of the image, the star, known as Herschel 36, is about 200 000 times brighter than our Sun. 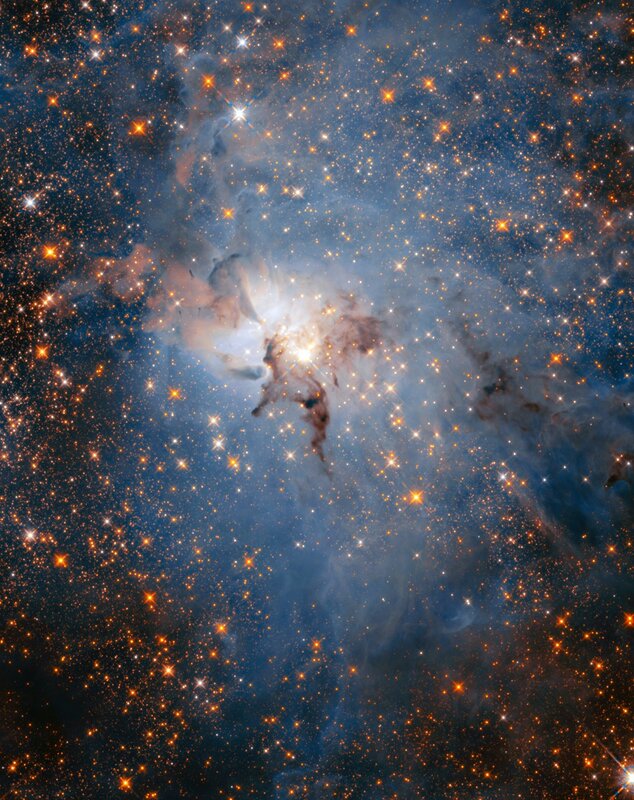 New stars are forming within dense clouds of gas and dust. Dark, elephant-like "trunks" of material indicate dense pieces of the cocoon that are resistant to erosion by the searing ultraviolet light of Herschel 36 and serve as nurseries for a new generation of stars. The infrared image reveals a completely different landscape, filled with stars. Making infrared observations of the cosmos allows astronomers to penetrate vast clouds of gas and dust and explore the things hidden behind or within them. The most obvious difference between Hubble’s infrared and visible photos of this region is the abundance of stars that fill the infrared field of view. Most of them are more distant, background stars located behind the nebula. However, some of them are young stars within the Lagoon Nebula itself. The giant star Herschel 36, near the centre of the frame, shines even brighter in this infrared view. Using the slider, the two images can be directly compared to each other.